As promised, I’m back with a home tour of the Talrejas. I’ve done many store tours in the past year and half but this would be the first home tour. As always, let’s start at the beginning. The Talrejas are old friends of my folks and had invited us for tea one evening during our trip to Bahrain. We went as you normally go over to friends’; it had been over 15 years since I last met them. I was no longer the skinny, college-going girl they knew, and neither were they young parents of toddlers. The years have given way to relocation, kids, grown-up kids, and grey hairs. I entered. I saw and I was floored. Seriously. You don’t plan on visiting someone’s home with the idea of capturing it in celluloid. I was lucky to be carrying my camera. This home had to be shown…so I asked the hosts and they happily agreed. So once the evening was drawing to a close and after gorging on the yummy samosas, dahi-vadas with sonth ki chuntney, I dashed downstairs to get the camera from the car and shoot some pictures as Ms. Talreja took me through the house narrating the story behind every artifact. The Talrejas live in a spacious, rented 3-BHK apartment close to a busy, commercial district of Bahrain. Ms. Talreja is a educationist-turned-homemaker while her husband works in the metals industry. They moved countries recently and had do up the home all over again with new furnishings. Now, that’s what makes a home interesting – when you have a story behind each one. Ready to join me on this house tour? You often hear readers saying it’s impossible to maintain a house where everything has a place. For the most part, this house showed me it was an achievable task. One thing about this spacious 3-bedroom house which would catch anyone’s attention is that it is clutter-free. 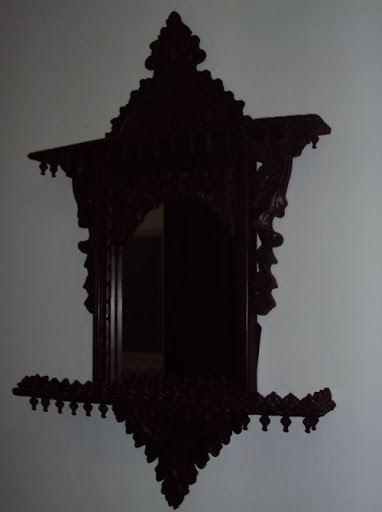 The foyer has a Middle-eastern style Jharokha and a Chinese lamp on one end. Very unique pieces made out of sea-shells. 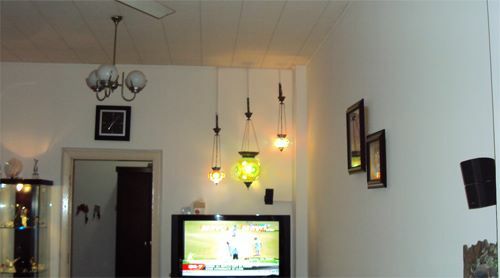 Another set of lamps in the dining area and vases from Home Center. There is no dearth of color in this house. Bursts of orange from vases picked from Home Center. To its side, are some ceramic flowers hand-made and gifted by a friend. A tall lamp and sparkling crystals shining in one corner of the living-dining section. And finally, the beautiful lady herself. In all honesty, I have never done a home tour before. But, there was no nervousness partly because it was someone you knew and genuinely appreciated what they had created from their travels. Style: It’s practical and personal. Not inspired by any designer or theme. Influence: I think it’s predominantly decorated with Middle-Eastern elements. Strikes a right balance between ethnic and modern elements, homely yet sophisticated. Images: Shot at location with permission from hosts. excellent, absolutely clutter free, I have had the pleasure of living in their house. gorgeous, loved the use of eclectic lamps to add character to the home. loved it! the lights and lamps are gorgeous.. She has a beautiful home.. as stunning as herself.. Lovely home tour! !